RUSH: Grab sound bites 3 and 4, maybe 5. Yeah, 3, 4, 5, 6. I want to clean up some things from last week when the NFL announced its new policy for the national anthem. Players on the field must stand rather than kneel. They can’t kneel. There will be penalties and fines if they do. The NFL said players can stay in the locker room, but if they come out — if they’re on the field during pregame during the anthem — they have to stand up. CHRIS SIMMS: It bothers me. Donald Trump and Mike Pence, #Winning. CHRISTINE BRENNAN: (echo) Trump has turned everything upside down. (stammers) It’s truly unbelievable that the owners then sided with him. CHRIS CANTY: The owners are essentially acquiescin’ to exactly what our president wanted. ROBIN ROBERTS: They are not being disrespectful to the flag. That is not the intent of those protests. How many times must it be said? MICHAEL KAY: President Trump has a very solid base. The NFL owners are running scared of that. WESLEY LOWERY: The teams caved to two pressure points, the president of the United States and their own fan bases. EUGENE ROBINSON: The owners decided they did not want to be harangued by the president of the United States every week. RUSH: What did…? Did you notice this guy Wesley Lowery? He is with Washington Post. “Teams caved to two pressure points: The president and their own fan base.” How dare they cave to the fan base? (chuckles) These journalists are livid that the NFL would cave to the fan base. They’re also livid that the NFL owners would cave to Trump. You know, these people on the left still will not admit that these kneeling protests of the United States flag are one of the reasons why ratings have been down so significantly. They continue to deny this. They think the games have been lousy. They think it was injuries to star quarterbacks, the length of time it takes to play the game… That stuff hasn’t changed. There have always been injuries to stars. NFL games have always taken three to 3-1/2 hours. Depending on the season, you have some teams that are terrible and don’t get any better, but that’s percentage-wise pretty consistent season to season. The one thing, the one thing that was new that accompanied the massive decline in TV ratings and attendance was the players looking like they were protesting the country, protesting the flag. And the American people who watched the game didn’t want to put up with it; they didn’t want to see it. To hell with it. They’re bombarded with all of this hate. They’re bombarded with it whenever they turn on the news. They’re bombarded with it whenever they watch television shows or go to the movies. And they’re sick of it! They’re sick of being bombarded by people who hate America, who don’t like America, who think America is guilty or what have you. And these people in sports journalism look at that and say, “Ah, that had nothing to do with it! “That’s not why their ratings are down.” So now the owners are “caving” to the fans. That’s essentially saying they’re caving to their customers. You know, this would not be an issue if they would have done this the first week. Now there’s some kind of a threat out there. There’s this reporter named Shaun King who is actually one of the big wigs in Black Lives Matter, and he’s trying to rev up a football-star boycott of the season unless Colin Kaepernick gets hired. He was the first player to kneel during the anthem, the so-called quarterback for the San Francisco 49ers — and Eric Reid, a teammate of his — and these two guys have not been picked up. They’re not currently on rosters, and this guy King is demanding that stars, and he says he’s got a lot of them. He’s gonna boycott the whole season until these two guys are hired. So we’ll see what happens with that. Here’s Trump reacting to it. Thursday morning, he was on Fox & Friends. THE PRESIDENT: I think that’s good. I don’t think people should be staying in locker rooms, but still I think it’s good. You have to stand proudly for the national anthem or you shouldn’t be playing. You shouldn’t be there. Maybe you shouldn’t be in the country. You have to stand proudly for the national anthem, and the NFL owners did the right thing if that’s what they’ve done. 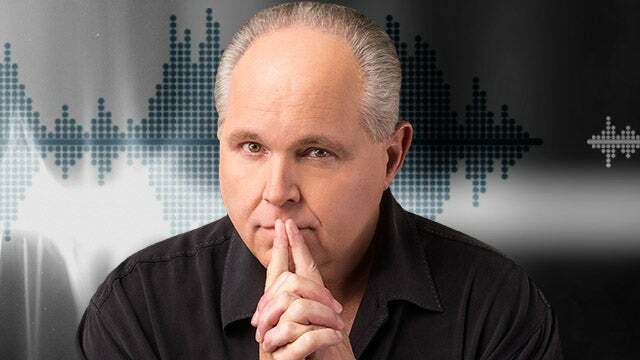 RUSH: “Maybe you shouldn’t be in the country.” Fast forward to sound bite No. 6, the Seahawks wide receiver Doug Baldwin. Well, he didn’t say it. MITCHELL: The hypocrisy is so profound. Take a look at any NFL stadium and people are getting hot dogs. People are getting beers. MITCHELL: They’re not standing and saluting the anthem for a large part. They’re not. They’re distracted. They’re fans at an event. And the fact that the players do not have this freedom of speech and that no one is even thinking about Colin Kaepernick, who’s lost his entire career over this issue, who has been, you know, basically blackballed and can’t be hired. Uh, it’s just outrageous. Now they’re accusing him of being blackballed and this kind of thing. There is no free speech freedom of speech here, and here’s a journalist mischaracterizing what’s going on. There is no freedom of speech. These are employees. These are salaried employees. Their bosses — their owners, the companies — can indeed tell them what to do! You try it where you work and see what happens. See if freedom of speech saves you. It won’t because there isn’t any. Freedom of speech involves the government not limiting what you can say. Except if you shout “fire” in a crowded theater or some such thing. But they claim he’s being blackballed, and they’re demanding — this guy’s demanding — he be hired or there’s gonna be a gigantic boycott of star players. If this had just… If the NFL had dealt with this the first week when Kaepernick decided to take a knee — if they’d stood up and said, “No,” but they… If anybody caved and cowered to anybody here, it was the NFL and the owners scared to death of the players and leftist activists, not Donald Trump. Donald Trump is doing what he can to save this league from a deep problem it finds itself in. 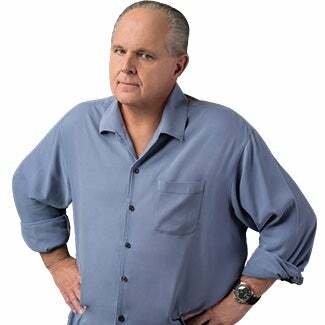 RUSH: This is Kate, Newtown, Connecticut. Great to have you. What’s up? What’s happening? CALLER: Wow, I’m really honored. I am a Rush Baby raised on your knowledge. You were talking about the football player who was putting the president down, saying that we’re gonna kick ’em out of the country if they didn’t conform to the president’s view. CALLER: Well, it really stinged me to hear him say that and thank you for correcting the fact that the president didn’t say he’d kick ’em out, unlike Andrew Cuomo who made it very clear that none of us were welcome in New York unless we believed what he believed. RUSH: You know, that’s a great point. And before Andrew Cuomo, it was the one-eyed guy, David Paterson. David Paterson, when he learned that I left New York state to escape high taxes, he said in a press conference, “If I had known that we could have gotten rid of Rush Limbaugh, I would have raised taxes sooner.” And the media laughed and chuckled, had a grand old time, as did I. It’s funny to know how irritated they get because of me. But you’re right, Cuomo — and he had to walk that back, didn’t he? CALLER: Well, he still implies this quite often. I don’t think he had to walk anything back. We’re always expected to stand and endure this constantly. Well, finally the eruption is taking place. We’re not gonna take it. RUSH: Really? What are you gonna do? CALLER: Hopefully we’re gonna primary everybody out. RUSH: Oh, I see. I see. But you’re in Connecticut. What’s Cuomo got to do with you? CALLER: I used to work there. RUSH: Ah. Okay. So you live in Connecticut, you commuted to work in New York. I got you. Man, you got soaked every which way. There was nothing you could do to escape it. I’m still glad you’re out there with enough money to have a radio to listen. 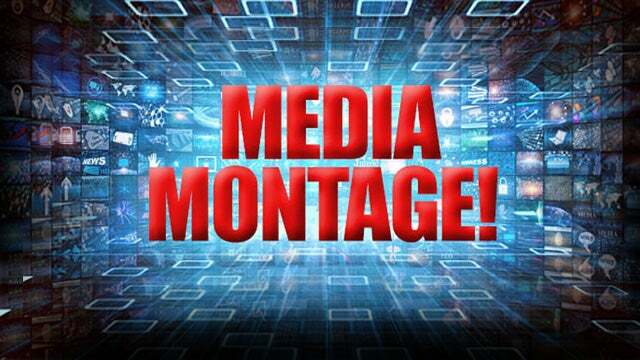 RUSH: Greg in Clinton Township — where is that, Michigan, by any chance? RUSH: Well, welcome, sir. Great to have you with us. How are you? CALLER: Well, I’m great, and thanks for having me. I want to get back to Mr. Kaepernick’s situation for just a moment, because I think there’s something here that’s missing from why he’s still absent. I’m a business owner, and oddly enough in sports equipment field. And if I am gonna hire somebody of notoriety, I don’t want someone who’s going to be an area of possible discourse. 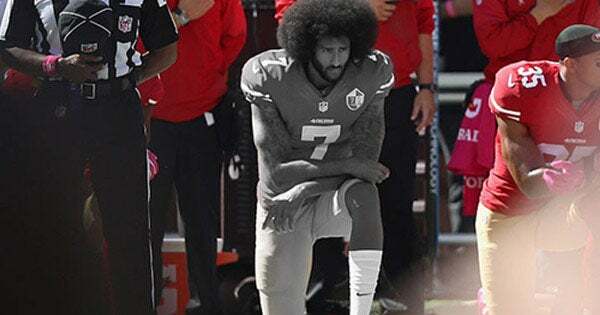 If you look at Kaepernick, now, whether or not his teammates would agree or disagree with what his stance is, there’s gonna be some that also disagree and there’s gonna be fans that disagree if someone signs him. So if I’m a business owner, I’ve got an equation to look at here. If I hire him or sign him, what’s the downside? And if that downside to me is greater than upside, I’m not going near him. RUSH: Well, I understand that. But what’s under attack, really, is your freedom as a business owner, and in this case the NFL’s owners’ freedom to do that. They are being pressured by a bunch of leftist social justice warriors, so to speak, to do something, to hire somebody they don’t want to hire. So the social justice warriors, well, they don’t want to hire ’em ’cause they’re racist, they don’t want to hire ’em because they’re against free speech, they don’t want to hire ’em ’cause they don’t like black people or whatever the usual excuse is. So we have once again pressure from the left to force people to behave and do things that they don’t want to do. They’re not violating any laws by not hiring this guy. It’s a business decision. I guarantee you, the reason they want Kaepernick hired is not because of Kaepernick. These people don’t care whether Kaepernick has a job. They want Kaepernick hired because they know he’ll kneel. They know that he will violate whatever NFL policy. They want Kaepernick on a roster precisely to cause trouble. They want there to be chaos, confusion, or controversy in the league over this. So Kaepernick, while they position it as having respect for Kaepernick and his talent and think that he’s being given the shaft by not being on a roster, the leftist protesters are actually using him as well, in a way. You could say he’s a political football. They don’t want Kaepernick to conform. They don’t want Kaepernick to follow whatever new rules there are. They want him there to violate them. In other words, they want Kaepernick to continue to take the arrows. And they’ll follow along behind the guy. They want him out there. They disguise this as caring about him and caring about his career and so forth. But what everybody forgets is that he walked out of his contract. Kaepernick is by no means the only guy in the country that the NFL owners don’t hire. There’s a lot of troublemakers out there that they don’t want to deal with. You don’t hear about it. The upset that would be to the fan base of this particular town, the market where he would be hired and whatever damage he could do in the locker room, those are good points. Anyway, we’ll see where this ends up. I think the NFL didn’t — I don’t know if he solved their problem or not here. I mean, they’ve gotten the president off their back and they have no doubt done the right thing for their fan base. There’s no question about that. But they have not done anything but anger the media here. The sports media, believe me, is livid and loaded for bear. Bob in Coronado, California. You’re back. Great to have you here. How are you doing, sir? CALLER: I’m doing great. Thanks Rush. Rush, the point I’d like to make today is, I think Trump is trying to erase the legacy of Barack Obama. And part of erasing that is erasing things that Obama did. I think part of it is also changing things that Obama did not do. And I bring up specifically the shootings in the cities. RUSH: Wait. What evidence do you have that they’re starting to listen to Trump? How so? RUSH: Now, wait a minute. You don’t want to put Farrakhan in the plus column here, do you? RUSH: I know what you’re saying. Farrakhan has followers. Farrakhan’s out there saying that the enemy of his is also Trump’s enemy, and so he’s not gonna criticize Trump anymore. Now, who are Farrakhan’s enemies? 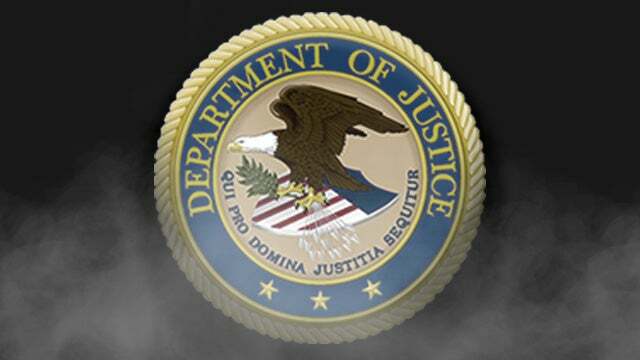 The Justice Department. Yeah. The Democrats don’t like it, I’ll guarantee you that. Well, they may try. I mean, they’re so deranged, they may try this. But they cannot come out and start trying to link Farrakhan to Trump. They can’t come out and try to rip Trump. This is different than if some clown at the KKK had said something, because minister fair dawn’s people vote Democrat. And when they like it or not, the Democrat Party depends Minister Farrakhan keeping his voters on the Democrat side of the aisle. So they have to be very careful. 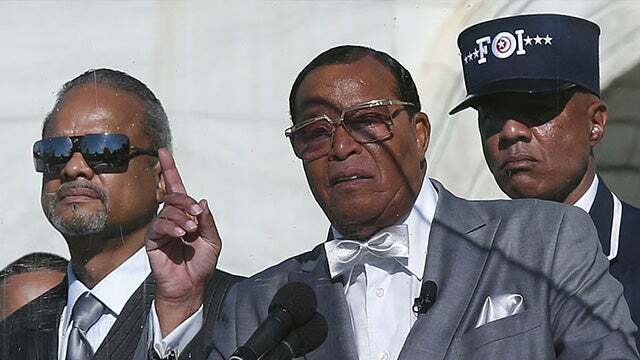 The Democrats, with Farrakhan now, quote, unquote, “praising” Trump, believe me, there’s a bunch of leftists that would love to start trying to link Trump to Farrakhan as a means of saying that Trump, “Oh, man this guy more radical…” But they can’t. They can’t. Because while they don’t sidle up to Farrakhan himself, they sidle up to his voters. Don’t… You know, the Nation of Islam is the Nation of Islam, and the Democrat Party, part of its allegiance to Islam is just that: The Nation of Islam. Now, the Nation of Islam’s Islam is not… It’s not… Well, I don’t know how close it is to, say, Osama Bin Laden’s version. Probably not that big a difference, but it still is a difference. It’s got United States civil rights roots as opposed to Middle Eastern Islam, which does not. But still, those Nation of Islam devotees of Minister Farrakhan, they vote Democrat. So they can’t appear — the Democrats cannot appear — to start mocking Calypso Louie, making fun of him or trying to destroy Trump over it because they’re deathly afraid of losing those voters. And you won’t hear… I bet you don’t hear much talk of this at all. In fact, ever since Farrakhan came out and made these comments, you really haven’t heard much commentary or analysis about it at all, because of course the Republicans don’t want to join in, but the Democrats are the key. Democrats are the key. There’s all kinds of little bitty things. Our last caller had a little bit of a point here. There’s all kinds of little things that could result in a significant erosion of African-American votes away from Democrat candidates for president. RUSH: David, Beaumont, Texas. Great to have you, sir. How you doing? CALLER: Great Rush. Mega dittos. Yeah, I’ve got a comment about the media’s reaction to the new NFL policy. So, you know, one of the things that they say is not only that the NFL is bowing to Trump, but also to its fan base. As if somehow, that is a bad thing. And I think when you compare that to these leftist causes — notably, you know, when you have a bakery that refuses to serve a homosexual couple a wedding cake or, you know, more famously, Chick-fil-A and their family values — then all you hear from the left, the cry is, “Well, the public won’t stand for this, the customers who pay the bills.” You know, so they spur these marches and, you know, sit-ins at the restaurants and all these things to put these people out of business. Yet somehow when it’s the NFL and it’s a cause they don’t like, well, it’s a bad thing for the fan base, the paying customer to be heard somehow. RUSH: You know, I made this point earlier in the program, and it’s a great point that you’re making out here. And that is, the media is claiming that the NFL’s caving to its fan base as though that’s some kind of a bad thing. And then they come out with this next comment, these people talking about the NFL fan base being NASCAR fans and Walmart fans and so forth. So it is kind of ironic and contradictory because in this case, the fans are a bunch of hayseed hicks, and the NFL owners ought to not listen, screw them. But you’re right; when it comes to their causes, the American people are uniformly supportive. This is a point that I’ve always made, like the Religious Freedom Restoration Act in Indiana, when it passed, the media starts covering it like everybody in America is opposed to it, is outraged and demanding that this be exposed and reversed because it’s horrific and so forth. You understand here, the Democrat Party, the American left learn this, love this, don’t love it, live it. The Democrat Party, the American left, has a veritable contempt for what they consider average Americans. I want to say something. I’ve thought this for a while. I was watching — it doesn’t matter what TV show. Have you ever thought of the contradiction, here are the Democrats and the left primarily, on one side of the aisle here they’re autocratic, they are demanding, they’ll do anything to rig, whatever. But then on the other hand, when it comes to elections, they’re hell-bent on winning. My point is that I think they’re gonna get tired eventually, if they already aren’t, of voters deciding things. The more the Democrats lose, the angrier they’re gonna get that voters have anything to say about issues, elections, presidents, and this kind of thing. Mark my words on this. They take control of everything they can, say in a campaign. They never do. They might make a show of it, but they don’t really care. They’re hateful and resentful. In their minds, the only thing standing in the way of them having the total control that they want is voters, or elections. Now, don’t misunderstand; I’m not suggesting that it’s gonna be any day now that they’re gonna be able to outlaw elections. But I am saying it’s the one thing they can’t control in the quest for power. The one thing standing in their way, as it is with everybody in this country that seeks power, is the voters. But rather than courting voters and rather than seducing them and trying to do things the voters want and get in the right direction, they operate against the will of the voters, ’cause they don’t have a majority of people with them. And their resentment for that, I guarantee you, is already manifest. Look at all of the things they did. They had an unlosable candidate, they thought, Hillary Clinton. And I purposely said unlosable rather than undefeatable, because she was eminently defeated. But they thought she couldn’t lose ’cause Trump couldn’t win. But even at that they rigged everything they could. They colluded with the Russians. They did all this. They arranged spying on the Trump campaign. They got in cahoots with the FISA court. They were in cahoots with British intelligence. They were in cahoots with everybody. They corrupted the Justice Department, the DOJ and the FBI. They still lost. Do you know how much they hate that? The one thing they can’t control is how you vote. And I’m just here to tell you they’re gonna find a way to overcome that obstacle, if they already aren’t. And they’re gonna keep looking for ways. And it isn’t gonna be pretty. RUSH: Jeanette in Mission, Texas. Jeanette, great to have you. How are you doing? CALLER: Hi, Rush. Thank you for having me. CALLER: I just wanted to make a comment about the NFL players and those that are protesting and looking for a different manner to protest. CALLER: I don’t see why the NFL owners can’t start looking to replace those players. I mean, we’ve got a lot of college players out there that are great and that are willing to stand for our American flag proudly. I don’t see where they just don’t get fired. I mean, we would in any other job. If we don’t abide by their rules, we’re fired immediately. I mean, why can’t that happen about these NFL players that refuse to stand for our flag? RUSH: Well, it’s a good question. There’s actually some substantive answers to that. And the number one answer, Jeanette, is talent level. One of the problems, quote, unquote, is that the best football players in the country are on rosters. They sell the tickets; they sell the TV ratings; the players are why people watch. Players, athletes of any sport, the more productive they are, the bigger star they are, the much greater latitude they’ve always had more misbehavior, hijinks. I mean, you’ve had players get drunk and get involved in auto accidents where people die, then they come back and play. The league does its thing trying to limit the punishment. It’s just the way it is. And this is not unique to America in 2018. Athletes in our country have been the closest thing to superstar royalty outside of Hollywood actors and actresses that we have. And so, yeah, there’s all kinds of people playing college football, but the ones that are not in the NFL are not there because they’re not good enough to be there. There’s not that big a pool to choose from. This is why they make so much money. It’s why they get 55% of the take, gross. The players get 55% of the take. Salary cap, add it up. CBA, the collective bargaining agreement, they get 55% of the take. That’s relatively new like in the last 20 years. Now, I’m sure there’s some NFL players listening to me, “He doesn’t know what he’s talking about. We’re a dime a dozen, Rush.” Yeah, if you get injured, nothing they can do about it, gotta replace you. But you’re not a dime a dozen, when you get right down to it. Every roster has on an active Sunday 53 people in uniform, times 32 teams. You go to training camp in July, late July, August, with 90 or more players. By the time opening day comes, they gotta be cut down to 53. Now, some of those people that get cut do come back and play on other teams. But we’re talking about a population in the country, let’s say 300 million, 250 million adults, 240, and out of that how many are qualified to play professional football, or baseball? I mean, it is a minute percentage, microscopic, who have the talent and the ability to do it. In any sport you’re talking about — football, baseball, what have you, basketball. So that’s the primary reason. The secondary reason would be the socioeconomic reason. If you start firing people for the usual things other people get fired for, you’re not gonna end up with enough people on a team to play a game. But your overall point is right on the money. Kaepernick did what he did on the job. And then he inspired other people do it. They could have found any other way of protest. Were they really trying to make these protests effective? Because they weren’t. They could have found any number of ways during the week. These guys can get a camera and a microphone any time they want it. But to do it during the anthem, tell me it wasn’t an anti-American thing. Roseanne, on the other hand, her tweet comments about Valerie Jarrett being what you would get if you crossed the Muslim Brotherhood with the Planet of the Apes, she didn’t say that at work. That was not part of her show. She said this during, quote, unquote, free time. Her show is canceled. She gets fired. Kaepernick too. 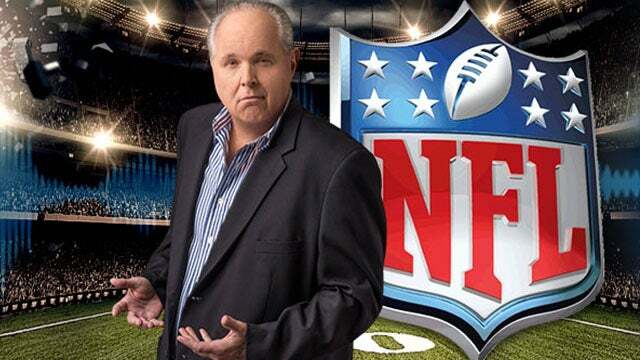 RUSH: If you want to stop the kneeling in the NFL, fine them points. Not money, not yards, points. For every kneeler, you lose three points, you lose a field goal. You can possibly start the game down 17 to nothing. CBS: NFL Anthem Policy Sparks Questions; Trump Suggests Kneeling Players Shouldn't Be in U.S.